This entry was posted on Saturday, 30 August 2008 at 11:08 and is filed under Uncategorized. You can follow any responses to this entry through the RSS 2.0 feed. You can leave a response, or trackback from your own site. surely first and foremost the views of the residents who live in the area who when given a choice between the masterplan and alternative projects voted by over 95% for dehann,s vision . the line you fight too keep is a transport link installed in a era when folkestone was the most direct route to europe. Wasn’t aware that The Remembrance Line was such an underdog. If you knew the alternative choice at the the time of the vote-Atilla the Hun would have had my vote! Apart from that Kerry you are so wrong. On the board of the Remembrance Line Association are: a professional environmental campaigner; a former town councilor; a professional artist; a railway technician; a proffesional military historian and a local resident – all of them Folkestone ratepayers – and all of them appalled by by a ‘masterplan’ which is suited to a ‘master race’ and nothing to do with Folkestone people. There is nothing whimsical going on here. They are for preserving and conserving the railway and it’s poigniant wartime connections. They are fighting to protect the destruction of what is intrinsically Folkestone. This is not some kind of mealy mouthed nimby group. Why not join us? Folkestone deserves your backing. Who voted over 95% for the Master Plan, certainly not the people who live in that area of Folkestone. There has been no debate, responsibility for managing Folkestone has been handed to Roger De Haan on a plate by Shepway District Council. There has been no consultation with the people of Folkestone. The Master Plan is beginning to fall apart, it is too expensive, speculative and is not a plan but an idea. An idea that is being questioned by the developers who have failed to invest and there is a problem with traffic flows and movements as well as service such as sewage, water, electricity etc. The Master Plan would be an environmental disaster with increased traffic on roads that cannot cope. Even if the branch line was to be removed there remains problems with the two roundabouts. There are morning and daytime traffic jams in Folkestone since the ASDA store opened with traffic backing up along Shellons Street, Grace Hill and Tontine Street. Can you imagine what a thousand extra cars will cause, excluding tourists and university staff and students. Like the Creative Quarter the Master Plan was a flop before it was put on paper. Richard I agree. Do you remember about 20 or so years ago, they had planned to do the same? There were models and meetings and promises of jobs and loads more. Nothing ever came of that either. It’s not a nice place to visit now at all. I remember when I was at school, for my history exam no less I had to look into and write an essay on the history of Folkestone. Most of Folkestone’s history is being destroyed, I loved learning about the history of my home town and it will always be a special place to me, but I see it now and hardly recognize the place. I understand change may be good, but destruction is certainly not. I believe in what you are trying to do and I have told my entire family and friends about your petition and asked them to sign it, but I think we both want this for different reasons, however I wish you all the luck in the world. Hope the campaign is going ok. I have just visited Land’s End and seen what badly thought out development can result in. 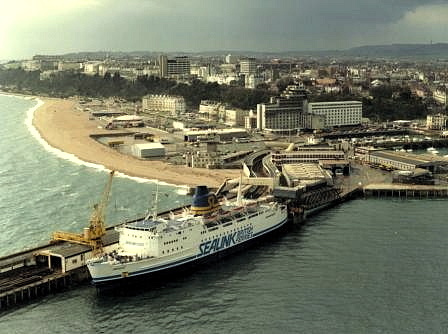 In Folkestone there is the opportunity to develop a historical facility around / incorporating the existing station, with marina for small boats on the inner or the larger seaward side. The idea of demolishing the Railway is surely just 1950s / 1960s regressive thinking ?? I am a member of the R L Association already, but wish you all every success, and you may forward this message to Planners / Councillors etc if you think it will help. Most redevelopment schemes have got nothing to do with enhancing the community. They generally involve private wealth generation by inflating property prices and anything public is usually commercial entertainment. If public money can be sucked in, so much more profit and less risk for the developer. Usually this is accompanied by a cavalier attitude to public rights of way. Heaven forbid that these should obstruct private profit! Where you once walked freely as of right, you will in future only go if you pass muster with unaccountable security goons who will eject you if you don’t look like a good spender. marina developed in the inner and/or outer harbour. Add to this the development of new homes and businesses around the harbour and sea front areas and new life would be breathed into the area. Railways are a big tourist draw and can sustain other developments (see for example Bridgnorth on the Severn Valley Railway, or the South Devon Railway at Torquay) they can also help to retain the historical significance of an area. When I was a child we always went to Folkstone from London and loved and enjoyed our holidays there. Since growing up and living in Folkstone and Dover over the past 20 years or more, sadly I have seen both go down hill. There is not much to see or do any more. many shops in Guildhall St. and Tontine St. have gone and are standing empty. Folkstone market on the sea front is no more. All amusement facilities near the beach have gone: cafés, the boating pool and others. What is wrong with Folkstone Council? Why have they let it all go? It’s disgusting, shame on the council. What is going to happen to Folkstone Harbour Station? Can it be reopened? It will be a shame if it stays closed. It is part of Folkstone’s heritage.